The greenery of the hula altar is symbolic of Laka, the sylvan goddess of hula. Her symbols were plants of the mountain forests: maile, hala pepe, `ie`ie, ki, `ôhia lehua, `ôhelo, and palai. After the performance, the altar is dismantled; every leaf and branch is taken to the ocean or a deep stream. As sacred greenery, it is not to tossed out with ordinary `ôpala (trash). 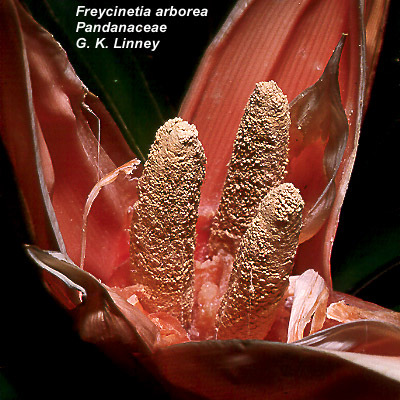 A favorite native forest plant of Hawai`i with a distinctive fragrance. The fragrant bark of its stems and leaves are indispensable at festive occasions for lei and garlands. The plant is a twining shrub of lower and middle mountain elevations. Laka, goddess of hula, was invoked as the goddess of maile. It is said that she can take the form of maile at will. It is also said that four sisters--Maile-ha`i-wale (Brittle Maile), Maile-lau-nui (Big Leaf Maile), Maile-lau-li`i (Small Leaf Maile), Maile-kaluhea (Fragrant Maile)--had four brothers. One sister married the king of Kohala, who had the brothers killed because they would not give him their magic fishhook. A fifth sister, who had mystical power, sang an incantation; then, with `ie`ie and maile vines snared and killed the king. She restored her brothers to life, and the siblings left Kohala forever. Wrote a Hawaiian: "Maile is used for leis for the people; for men, women and children; for the chiefs, the noted people, and the rich people; for the farmer, for the oppressed, the branded servant...and greatly used in the composing of songs, hulas, chants, dirges, and various other compositions." Native trees in the lily family, with golden flowers that grow to a height of 35 feet. It is a dry district-loving tree, found at an elevation between 1,000-2,000 feet, commonly in Kona and Ka`û, Hawai`i. Its wood is white with reddish streaks and is extremely soft. It was used in carving their images. The sap of some species was used formerly for varied medicinal needs and today is used for varnish. Its leaves are narrow and in tufts at branch ends; its fruits, clustered and yellow. This is one of the five standard plants used in the hula altar to Laka. 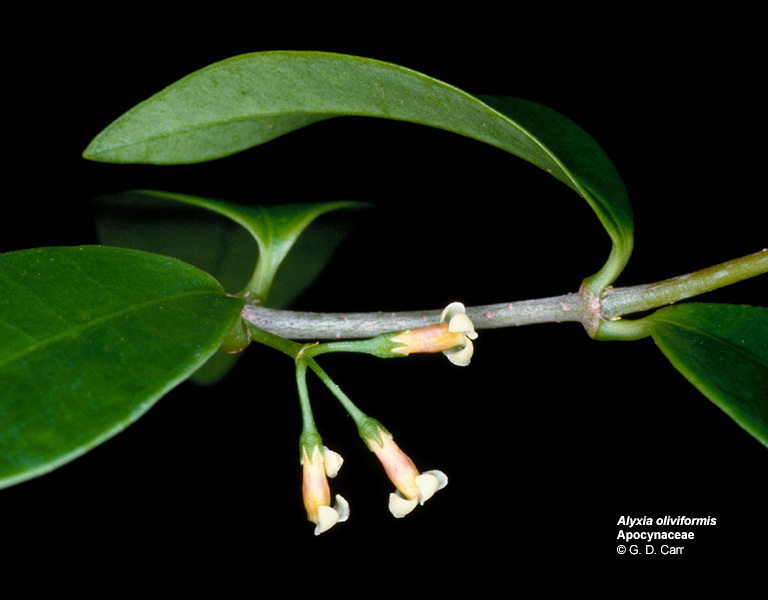 An indigenous forest vine, which often grows on koa (a valuable hardwood) and `ôhia trees. Spiny-leafed, a cousin to hala (pandanus). Woody, climbing stem flourish in Maui’s moist forests at 1,000-4,000 feet. 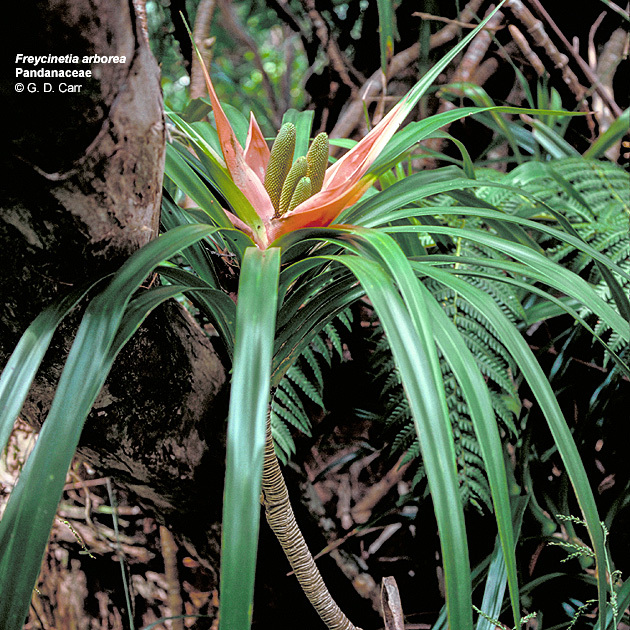 Beautiful clustered flower spikes, several inches long, nestle within a protective tuft of apricot, light orange or rose-colored bracts (modified leaves). Its brittle, woody stems are about an inch in diameter. Long, sturdy aerial roots provides material for the famous Hawaiian twined baskets, once "the finest in all of Polynesia"; close fitting coverings around gourds, calabashes, and bottles; fish and shrimp traps; feathered images and helmets, and cordage. Its fruit is a spike with orange berries. It is easily recognizable by its narrow leaves, which look braided at the base. Lâ`ie (shortened form for lau i`e), on O`ahu, means "leaf of the i`ei`e." Considered sacred to the forest god Kû as well as to the demigoddess of hula, Lauka`ie`ie, it is used for ceremonial purposes. "The `ie`ie, the `ie`ie; the lightning, this is the `ie`ie." Also, it is said that this vine embodies the spirit of a beautiful maiden, Lauka`ie`ie (leaf of the `ie`ie), who was cared for by the goddess Hina. She was given to an elderly couple; her playmates were the birds and flowers. In time, she married a birdman. One day, the time came for her to change form. Her eyes flashed fire, as leaves sprouted on her slender body. Her husband carried her to the forest, exhorting her to climb the trees and twine her long leaves around them. "Let your blazing red flowers shine between the leaves...like eyes of fire. Give all your beauty to the `ôhi`a trees of the forest," he urged. And so the maiden became the `ie`ie vine. A plant with a slender stem ringed with leaf scars and clusters of leaves arranged in spirals at the tip of each branch. The narrow, oblong leaves, 1-2 feet long, are smooth and flexible. Commonly found at the lower edges of forests. The ti plant was brought to Hawai'i by the Polynesians. Ti leaves were traditionally used for many ceremonial purposes. Medicinally, they are used for poultices, compresses to relieve fever,and as a headache reliever. The leaves (laki, lau`i, or la`i) make whistles, lei (do not pluralize Hawaiian words with an "s"), house thatch, rain capes, sandals, hula skirts, eating plates, food wrappings (for example, the bundled main dish called lau lau), table decorations, fodder for horses, fish bait, and sliding material for children enjoying a downhill sport. Its large white root supplies `ôkolehao, a high-grade, transparent brandy. Ti is believed to ward off evil spirits and bring good luck. It is an emblem of divine power. The goddess Hina garlanded herself with ti leaves. When hiking in Hawai`i, you may see rocks wrapped in ti leaves. These are offerings made by hikers to the gods to thank them for the beauty and/or to ask for protection from the elements. If you don't know what you're doing, don't be a copycat. It is in your interest NOT to disturb the flora and the rocks. You may, instead, offend the gods, especially if you use stones taken from Hawaiian temples (heiau). How would you know? Remember what your Mom taught you: See but don't touch. 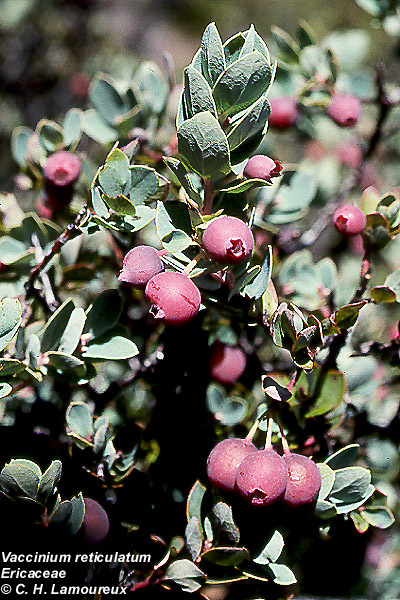 A small native shrub in the cranberry family and related to blueberries; it has many branches with many small, rounded toothed leaves, and bears round, 1/4-inch, red or yellow berries, which are edible raw or cooked for sauce. A common shrub at The Volcanoes National Park and Haleakalâ. Formerly baked into scrumptious pies, `ôhelo is still enjoyed as jelly. This is Pele's favorite snack. A sacred native forest tree. `Ôhia refers to the craggy, gnarly tree; lehua, the "pom-pom or shaving brush" blossom. Its leaves and branching patterns vary greatly within the species, thus the name "polymorpha" ("many forms"). On the slopes of Mauna Kea and Mauna Loa, on the Big Island, the tree grows to 100 feet tall. Its forests, sacred to Pele, dominate the uplands of Maui and Hawai`i, growing between the 1,000 and 9,000 foot levels, serving integral roles in the ecosystem. It is said that `ôhi`a forests embody the omniscient powers of creation, Kû and Kâne. 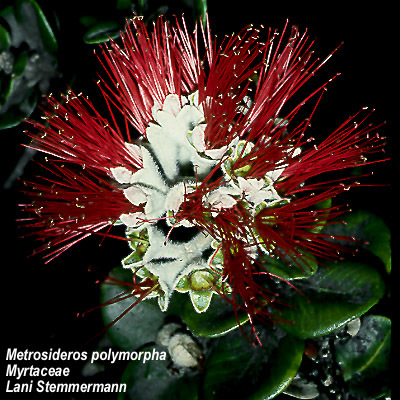 The bright-red staminate flowers (lehua) are full of honey, food of the `i`iwi, native honeycreeper birds that match in scarlet plumage the color of the blossoms that they pollinate. The `i`iwi are highly unique and unfortunately are declining in numbers. The wood was traditionally used for rafters, canoe seats and gunwales, as well as for sculpture. Popular in Hawaiian songs, stories and legends, dance, and quilt designs. The common red form is the flower of the Big Island of Hawai`i. Beautiful leis are made of its blossoms, but be mindful when you pick them. If lehua blossoms are plucked on the way to the mountains, it will rain. Small wonder that it rains so much on the Big Island! Unwary tourists stop and pick roadside lehua blossoms on the way up to the Volcanoes National Park. A native fern, growing wild and cultivated, 95-130 cm high. The lacy, ovate fronds look much like those of the pala`â but are somewhat hairy instead of smooth. The palai was one of the important plants placed on the hula altar to Laka, goddess of hula; it is famous in song, Ka liko o ka palai i wilia me ke `ala (name song), the young fern frond is interwoven with fragrance. Also, palapalai, which was used for its brown dye extracted from the fronds. It is said to have been worn by Hi`iaka, Pele’s sister, about her hips. She used the fern to trip and entangle the mo`o (lizard, reptile, water spirit), when in battle with them.